Nominators may consider contacting nominee’s colleagues familiar with employee's work who can support the nomination. Ensure that those supporting the nomination complete and submit a letter of reference. Nominations reviewed by the committee and proposed winners selected. Proposed winners are then vetted with managers/supervisors. Your Georgia Tech login (ID and password) to access InfoReady, the nomination system. Questions to Answer. Each award includes its own set of questions to answer. This is in lieu of you writing a nomination letter. You can go to the award of your choice and click on the Start the Nomination button and download the questions. Three letters of support. Thoughtfully consider people who can explain different aspects of the employee’s accomplishment. The letters can come from a supervisor, colleague, client, student, or other members of the community who was directly affected by the employee’s work. The goal is to fully describe, from as many different viewpoints as possible, the employee’s attitude, specific behaviors, approach, and results. Here are some tips for writing a successful nomination or support letter. Completely filled out the application in InfoReady. Filled out the questionnaire and attached it within InfoReady. Requested three letters of support. You can do this via InfoReady or through your own methods. If you send the request via InfoReady, Supporters will have the opportunity to attach the letter directly within InfoReady. If you reach out to them outside of InfoReady, they can send you their letter and you can attach the letter within InfoReady. The Staff Awards committee will review all applications equally. However, if an application is missing any of the nomination criteria (missing questionnaire or not enough letters of support), their application will no longer be considered. Ensure your application is filled out completely. Check for any misspellings! Get support. Split up the nomination questions with coworkers who are willing to help. Avoid jargon and be sure to spell out acronyms. While you are familiar with your nominee’s work, more than likely the members of the selection committee won’t be. Include measurable results. Numbers are powerful! Where appropriate, include measurable results that show how the nominee was able to save money, improve upon a process, saved time, increased staff morale, etc. Be descriptive in your nomination. Try to write more than one-sentence answers for each question. Elaborate and prove to the committee why your nominee is the best person to win the award. Use adjectives. Think about the impact your nominee has had and what it would be like if your nominee had not done what they did for you to nominate them. Select the award you would like to nominate someone for. Click the Start the Nomination button. You will be re-directed to the InfoReady site. 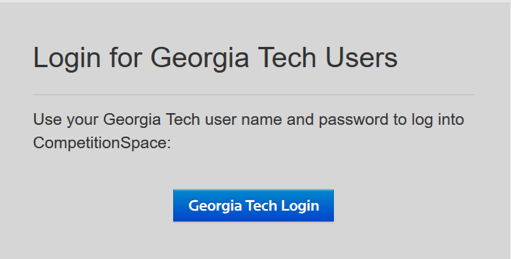 Click on the box that says "Login for Georgia Tech Users." 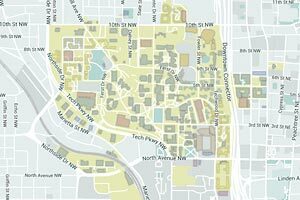 Click the blue Georgia Tech Login button and use your GT ID and password to sign on. You will be presented to a page full of award for staff AND faculty. You can scroll to find the award or use the search box to find the award. For questions not answered below, please contact Candice Bovian. Do I qualify for an award if I am not director level or above? Absolutely! The staff awards are for all staff who have been employed in a full-time, permanent position for at least 12 months and in good standing. If you or someone you know meets the criteria for an award then, nominate them!. Definitely! You just need to fill out the application and answer the questions as if you were nominating someone else (i.e., submit your nomination in 3rd person). You will still be responsible for acquiring three letters of support. 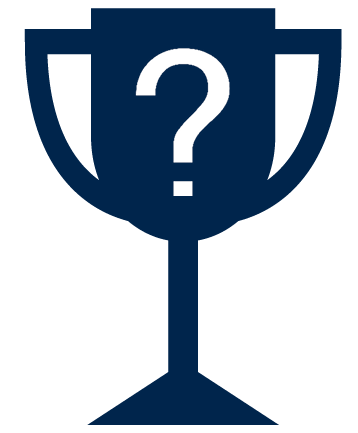 Who is on the Staff Awards selection committee? The Staff Awards selection committee is comprised of 10 to 12 individuals from a variety of job classifications and departments. Will the selection committee have the flexibility to move nominees to an award category that better suits the nominee? Yes. The selection committee will have the ability to place a nominee in another award category that the nominee may be better suited for. A member of the selection committee will notify the nominator and discuss their recommendation if needed. How long does the nomination process take? The nomination process varies by individual, however, follow the three steps under the Before You Begin section to ensure you’re prepared before starting. Is there a minimum number of years you have to be employed before you can be considered for a nomination? Yes. A nominee needs to be in a full-time, permanent position for at least 12 months and in good standing in order to be nominated for an award. Is there a limit to the number of nominees one college or department can submit? Not at all! Colleges and departments are encouraged to submit nominations for employees who meet the qualifications for each of the awards. Are research faculty eligible for staff awards? The staff awards are for staff and non-tenure track faculty. However, if a research faculty member is nominated for their work in a non-research capacity—an administrative or organizational capacity—the nomination will be considered. Otherwise, research faculty nominations should be directed to the other Institute awards listed at http://www.specialevents.gatech.edu/events/faculty-staff-honors. Is there an approval or vetting process for award recipients? Yes. After the committee has selected a winner for each award, the names of the recommended award recipients will go to (1) the nominee’s direct manager, (2) the nominee’s unit HR Business Partner or representative, and (3) senior Institute leadership to ensure that the employee is in good standing with the Institute. Can individuals previously nominated be nominated again this year? Previous nominees can be nominated again this year if the nomination represents new accomplishments from the past year. Can previous winners be nominated again this year? Previous winners can only be nominated if it has been at least three years since they won. The nomination should reflect new accomplishments from the past year. How many people are considered a team? A team is considered a group of two or more people.